Source: CICH graphic created using data adapted from the First Nations Regional Longitudinal Health Survey (RHS) 2008/10, National report on adults, youth and children living in First Nations Communities. https://fnigc.ca/sites/default/files/docs/first_nations_regional_health_survey_rhs_2008-10_-_national_report.pdf -accessed July 23, 2017. 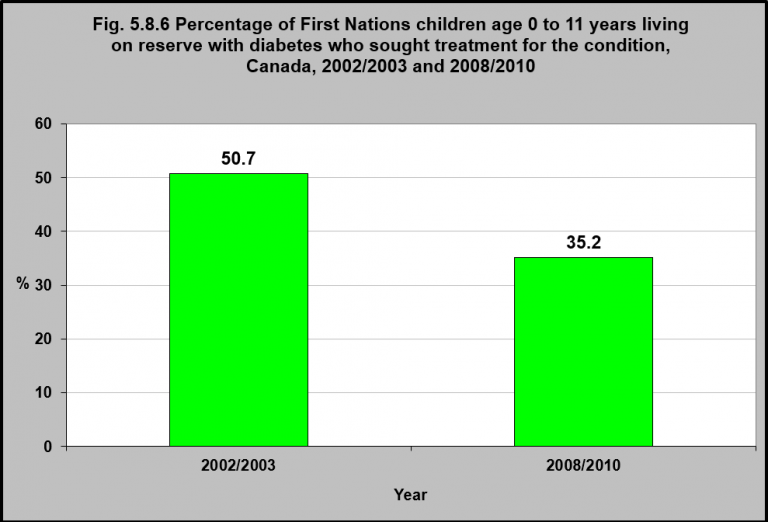 In 2008/2010, only 35% of First Nations children living on reserve under age 11 who had diabetes sought treatment for their condition. That was down from 50.7% in 2002/03. Diabetes is considered to be an epidemic in First Nations communities. Prevalence of diabetes among First Nations adults is 3-5 times that of non-First Nations adults1, and First Nations individuals are more likely to experience diabetes related complications.2 Additionally, the onset of diabetes is at a younger age in First Nations individuals compared to non-First Nations, and rates of diabetes among First Nations children have more than tripled over the period 1980 to 2005.3 Challenges such as accessing health care services (especially in remote rural locations), limited diabetes care providers and nutritionists, healthcare provider retention and shortage problems, limited knowledge about diabetes-related complications by generalist healthcare practitioners, and limited cultural safety in health care settings can compound care for those with diabetes or diabetes related complications.4 The prevalence of diabetes in First Nations communities must be understood as a reflection of economic and social conditions.5 As a result, strategies that focus solely on assisting an individual in making healthier choices and changing individual health behaviours will be ineffective. A holistic approach which addresses the multiple and complex risk factors is needed to prevent and alleviate Type 2 diabetes and its complications in First Nations communities. 1Dyck, R., Osgood, N., Hsiang Lin, T., Gao, A., & Stang, M.R. (2010). Epidemiology of diabetes mellitus among First Nations and non-First Nations adults. Canadian Medical Association Journal, 182(3), 249-256; Harris, S.B., Bhattacharyya, O., Dyck, R., Naqshbandi Hayward, M., & Toth, E.L. (2013). Canadian Diabetes Association 2013 clinical practice guidelines for the prevention of diabetes in Canada. Canadian Journal of Diabetes, 37(suppl 1, S1-S212. 2Oster, R.T., Virani, S., Strong, D., Shade, S., & Toth, E.L. (2009). Diabetes care and health status of First Nations individuals with type 2 diabetes in Alberta. Canadian Family Physician, 55(4), 386-393. 5Ghosh, H. (2012). Urban reality of type 2 diabetes among First Nations of Eastern Ontario: Western science and Indigenous perceptions. Journal of Global Citizenship & Equity Education, 2(2), 158-181.